Updated 7:10 p.m. | Posted 11:42 a.m.
Police officers who shot and killed Thurman Blevins in a north Minneapolis alley on June 23 were justified under the law in using deadly force, Hennepin County Attorney Mike Freeman said in a prepared statement, which he'd planned to read Monday before family members and activists shouted him down. Freeman on Monday had planned a 20-minute public review of the evidence, including a detailed chronology of events, saying he would announce any criminal charges toward the end. 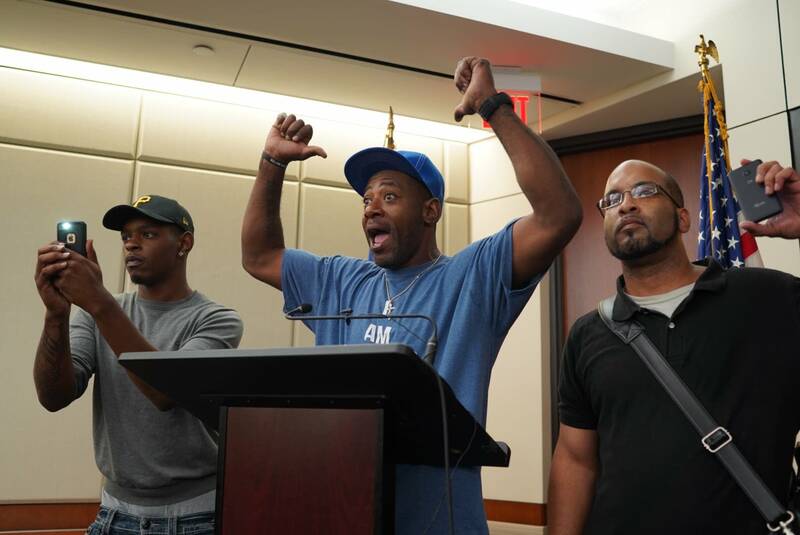 However, Blevins' family members and supporters, anticipating Freeman did not intend to charge the officers, began protesting at the start of the press conference. Freeman and his staff exited the room after a few minutes and activists and family members took over the podium. 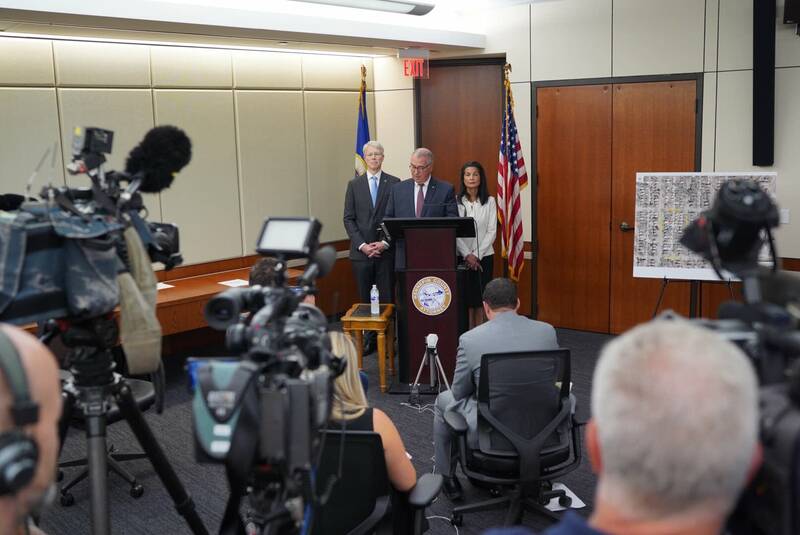 Freeman's office later released the prosecutor's full statement, which said no charges would be coming against officers Justin Schmidt and Ryan Kelly for the killing of Blevins in a Minneapolis alley. "When Mr. Blevins fled from the officers with a loaded handgun, refused to follow their commands for him to stop and show his hands and then took the gun out of his pocket and turned toward the officers, Mr. Blevins represented a danger to the lives of Officer Schmidt and Officer Kelly," Freeman said in the statement, noting that Minnesota law allows officers to use deadly force in such circumstances. Freeman talked to reporters Monday afternoon. The video released Sunday by Minneapolis Mayor Jacob Frey shows Schmidt and Kelly in their squad, driving and looking for a man in a tank top who was reported to be shooting a handgun in the air. They appear to spot a man matching the description. One officer says he sees a gun and both begin pursuing Blevins on foot, down the street and into a north Minneapolis alley. "Stop or I'll shoot," one officer yells as he pursues Blevins, 31. Blevins at one point appears to respond, "Why?" Earlier Monday morning, Minneapolis police union chief Bob Kroll said the video showed Minneapolis officers had no choice but to shoot Thurman Blevins, adding that the investigation will also show Blevins shot at police during the chase. Investigators looking into the shooting, however, have not said whether Blevins fired a gun during the chase. Freeman, though, said later in the day he's not certain that Blevins fired at the officers. In a statement released Monday, Minneapolis Police Chief Medaria Arradondo said he respects and accepts Freeman's decision. The statement went on to say that the department could not comment on the incident because the case was still under internal investigation, but that Arradondo would be able to comment after the criminal and internal investigations are complete. After Freeman exited his Monday morning press conference, Blevins' cousin Sydnee Brown took over the podium. She said protesters were "here for truth and justice" and argued that the video showed the police officers were not in fear of their lives when they confronted Blevins. Other family members said the description police had when they arrived at the scene did not match Blevins and that officers could not have seen a gun. "I don't want the media and the world to think that we are angry. We're not angry. We're more so disgusted," Brown said. 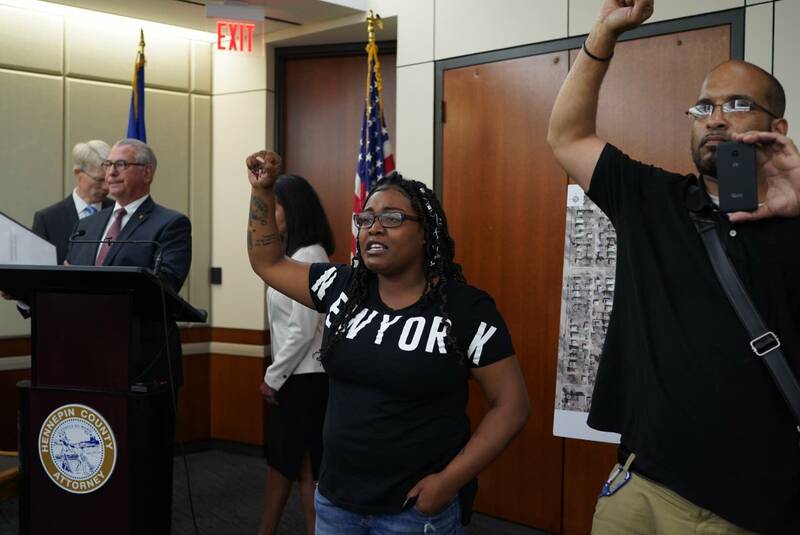 "We're disgusted by the leaders of the world, we're disgusted by the leaders of Minneapolis and Minnesota, and at the end of the day, we want the cops arrested."